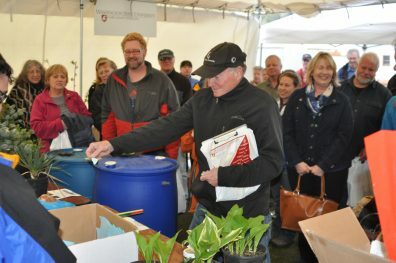 The Small Acreage program provides educational workshops and other outreach to residents on how to manage issues such as mud and manure management, fencing and pasture management, and other water quality topics unique to rural properties. If you are interested in receiving emails about upcoming classes and events, please sign up for the Small Acreage Program Listserv . 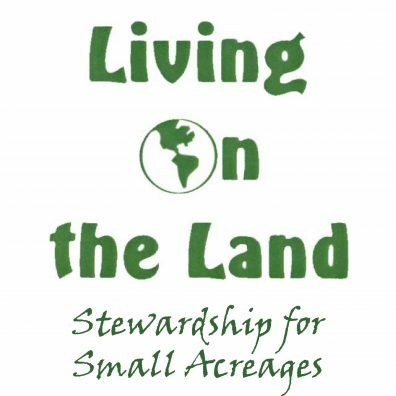 Living on the Land is a 12 week class series where small acreage landowners learn stewardship practices to help better care for their land. Living On the Land participants learn about important topics pertaining to soil, water, plants and animals that guide sound stewardship decisions for small acreage management. Topics are presented by local and regional experts and include pasture management, controlling weeds, wildlife, soil health, well & septic maintenance, and many more. Graduates of this training come away with knowledge about how different aspects of their property interact, practices that enhance natural resources, and helpful strategies for improving their property by taking a whole farm approach. Registration: Before you register, you must take a pre-registration survey. This helps us ensure the class will be a good fit for you. Class size is limited to 30 students and registration fills quickly, so fill out the survey soon! Upon completion of the survey, you will be contacted and given a registration link. Please allow several days for your survey to be reviewed and registration link sent. Ten farms opened their doors to the public on Saturday, September 15, to show the bounty of local agriculture in Clark County and gave neighbors an opportunity to tour and meet their area farmers. Over one thousand area residents came out to participate in a variety of fun-filled events such as animal petting, hay rides, self-guided tours, and photo ops with alpacas. Farms offered tours and sold farm fresh products. Registration: not needed. Just show up! How do I sign up? To register for a Well and Septic workshop, select from these options, all take place from 6pm to 9pm. What: Homeowners with septic systems and wells are invited to attend the Well and Septic workshop to learn valuable tips about maintaining their septic system and protecting their water supply. Clark County homeowners with owner-occupied, gravity fed septic systems can get certified to perform their own septic inspection at the workshop, saving money while learning important maintenance tips. Gravity fed septic systems must be inspected every three years with every other inspection performed by a certified O&M professional. Septic inspection training and well safety tips will be presented by officials from Clark County Public Health, who help homeowners meet regulations protecting surface and ground water by ensuring septic systems and wells operate properly. By participating in the workshop and taking a short exam, homeowners can perform their next septic inspection and file it with Clark County Public Health rather than hiring a certified O&M professional to do it. 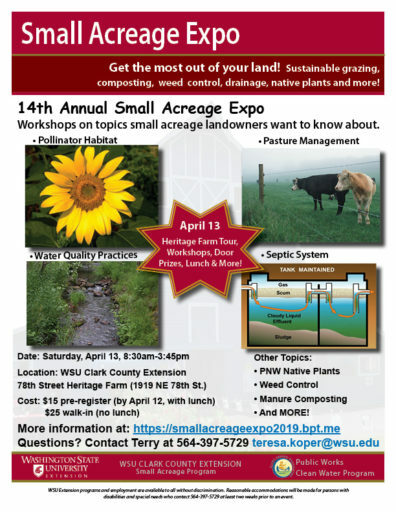 WSU Clark County Extension and the Public Works Clean Water Program are celebrating our 14th Annual Small Acreage Expo on Saturday, April 13 at the 78th Street Heritage Farm. This is fun-filled event, with eleven different workshops held throughout the day on topics such as sustainable pasture management, composting, pollinators, addressing landscape drainage, and landscaping with native plants. Become certified to self-inspect your gravity-fed septic system. 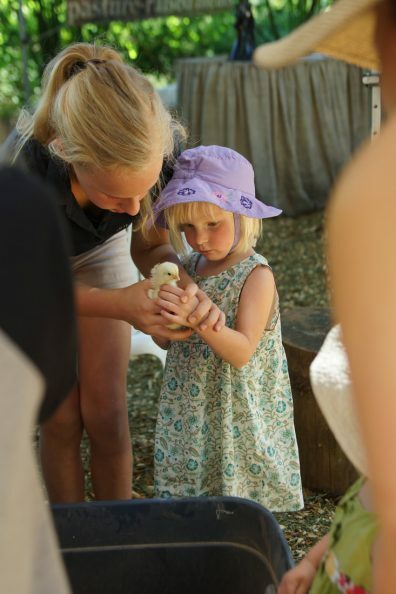 Take a tour of the 78th St. Heritage Farm and much more! Participants will also have the opportunity to peruse educational booths to learn more about local organizations and agencies serving the small acreage community. They say “a picture is worth a thousand words” … Tours of farms and properties that follow clean water management practices, such as guttering to reduce mud, fencing to keep animals from eroding streams, composting of manure, and siting of outbuildings to improve efficiency, help participants see what is possible on their own property. The Small Acreage Program, supported by Clark County’s Clean Water Program, wishes to publicly recognize residents who are implementing clean water management practices on their acreage. If you or someone you know are doing good things on their small farms or rural property to protect our water, please let us know! Drainage – have gutters and downspouts on your buildings; and your runoff does not discharge directly into streams, creeks, or ditches? Vegetation features – have vegetation around steams, creeks, and wetlands; livestock fenced out or restricted from waterways? Limited erosion & compaction – have limited areas of bare soil? 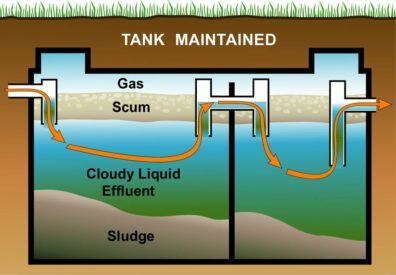 Inspected septic – know the location and type of septic system and when it was last inspected; limit activity on drainfield? Protected Wellhead – know where your well is located and wellhead is adequately protected? Safe chemical & fuel storage – store your chemicals and fuels properly away from wells and septic systems? Livestock manure – manage manure to minimize nutrient runoff? Manage pasture – have few weeds, limited bare soil areas, and little compaction in your pasture? If you do some or all of these, you should consider applying to receive a Clean Water Sign. 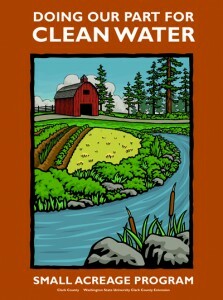 The Clean Water Sign shows your neighbors and the public that you are managing your land in ways that also protect our precious local waterways. Completing our Assessment Guide for Small Acreages will give you an idea if you might qualify to receive this free Clean Water sign. Send your completed survey to the Small AcreageCoordinator at smallacreage@clark.wa.gov and you will be contacted for a site visit to determine if you qualify for a sign. Are you a small acreage farmer looking to improve your business? The Ag Entrepreneurship & Business Planning Class can help you develop a successful business plan for your farm business. This 10 week course occurs every winter. Class topics include business planning, marketing, research methods, budget and record keeping, taxes, regulations and much more. 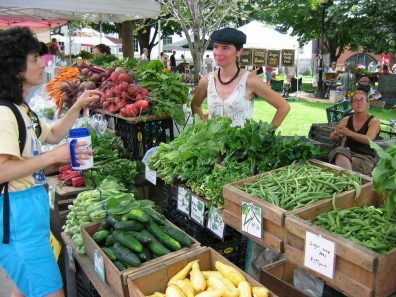 Classes are taught by local farm marketing specialists, accountants, attorneys, agricultural professionals, and farmers sharing their farming and marketing experience. At the end of the course, students will emerge with a full business plan to take with them to guide their farm business decisions into the future. Registration is $100 per family or farm. Partial scholarships are available on a limited basis. Before you register, you must take our pre-registration survey.